That alone just set red lights. I was baffled because this book showed a ALOT of promise and my friend is just a book devourer, so much so that her list of books are endless. So, I being who I am with nothing better to read dove right in. I was looking for a ghost story so I took upon myself to get on with it. Our story has an average start; MC has to move all the way with her parents to England because of her parent’s job and hello new lifestyle. Rory, our heroine made me laugh with her quirky, blabbering and southern-like ways. I honestly thought “okay this is going to be amazing!” actually I said this aloud. …I had spoken too soon. Although she was likable it didn’t last long, especially when Boo (nickname) came in and outshined her. I completely forgot about Rory and I didn’t want to know anything else about her worries, fears, and oh-goodness-life is too hard-how can I go on? Boo was such a fighter with an awesome personality despite having gone through more to acquire an ability to see ghost than Rory, that I felt that to make myself be less of a basher I had to stop and say “okay everyone is not the same so deal with it your own way”, but when you meet Boo I hope she wins you over. You’ll enjoy her overall fight and perseverance to move on, while Rory was a wreck a lot of the time. Now romance wise…it was less than average. Of course typical new girl attracts one the cutest guy’s in school who is also a prefect (hahaha think HP that’s what he is) and legit cannot say I was fond of him and their chemistry was lacking in my opinion so that was a no no. He just seemed sooooo boring and we-can’t-be-seen-together-because-I am a-prefect-and-you’re-the-new-girl. ARE YOU KIDDING ME!!!! OUTRAGEOUS he certainly didn’t have a problem sticking his tongue down her throat when they were alone. Honestly, if I could meet Jerome (yes this is his name) I wouldn’t bother. Looking back at this review I am just going to say that this book was a fail for me and the author brought in some characters I don’t think were entirely necessary. It made it seem like there was more behind the present story at hand, yes I am thinking secret agendas and I wasn’t impressed. Oh finally the ending is. That’s what you feel like, no words because I am not even sure to this day what it means. Doing more research I have found out that there’ll be more (god save us). To whoever wants to maybe tackle this and reach the finish line, I implore you to do that…buest best of luck. 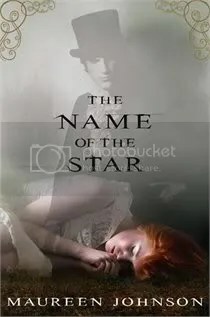 This entry was posted in 2012, Reviews and tagged Book Blog, Book Reviews, Books, Fantasy, Horror, literature, Maureen Johnson, Meli, Mystery, Paranormal, Tangy Marvels, The Name of the Star, Young Adult by dreamingwithink. Bookmark the permalink.